It was Francesco Tonninelli (from Enoteca Castagnetana in Castagneta Carducci) who, over the last years, introduced me to the most interesting wines from Bolgheri (Tuscan west coast). As a result I visited Grattamacco in 2008, and this year Le Macchiole. 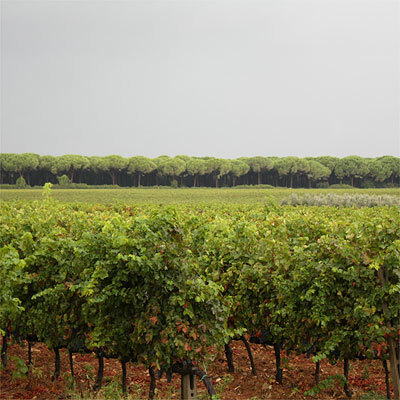 Le Macchiole: the vineyard behind the cellar, with the typical pine trees on the background (on a rare cloudy day). Bolgheri is a modern Italian wine area: the development towards today’s typical Bolgheri wines has only begun in the second half of the last century. Grapes have been grown here since long, producing more or less anonymous, local wines. But today’s famous wineries are mostly the result of investments from newcomers, people from the classic Chianti and Piedmont regions (for more details also see the Grattamacco-story from last year). In contrast, Le Macchiole emerges from the local winery from the Campolmi family, originally about 4 hectares producing Sangiovese and Trebbiano/Vermentino. The old winery was located in the lowlands towards the sea, surrounding the Campolmi restaurant, at the time the family’s major source of income. From about 40 – 50 years ago interesting developments took place on the hillsides just behind the Campolmi premises, intriguing the young Eugenio. In the 70’s he went to France, to learn about the French way of winemaking, and in 1983 he joined the Bolgheri pioneers (a/o Sassicaia, Ornellaia and Grattamacco) by selling his old vineyards in the plains and acquiring his first 6 hectares in the Bolgheri foothills. With the last acquisition of land in 2004 the estate now counts 22 hectares. Today the domain is led by Cinzia Campolmi, after her husband Eugenio passed away in 2002. 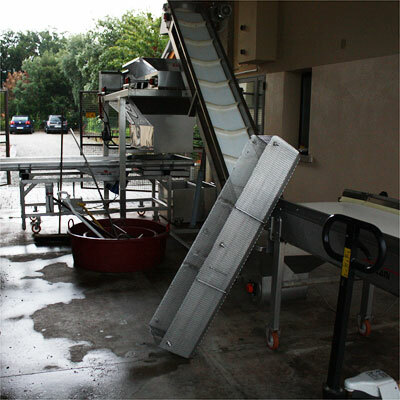 Le Macchiole: first sorting table at the right side. After destemming there is a second manual sorting of the individual berries (belt on the left). Then the whole, uncrushed berries are fermented. The primary reason to call the region ‘modern’ is the use of international grape varieties. Campolmi knew the potential of various wine grapes (the Merlot in Bordeaux, the Syrah, or actually Shiraz, in Australia) but decided experimentation was needed to see how the different varieties would behave on the Tuscan soils. More specific: in the early days of the winery it was necessary to search for an identity, the identity of the new estate. So in 1983 the first 6 hectares were planted with cabernet sauvignon, cabernet franc, merlot, syrah, sangiovese and barbera, and for white with Vermentino, Chardonnay and sauvignon. For red survived: cabernet franc (40%), merlot (35%), Syrah (15%) and Sangiovese (10%), for white Chardonnay (50%) and Sauvignon (50%). Interesting detail: around 2000 all rootstocks hosting Cabernet sauvignon were re-grafted with Cabernet franc. In the Bolgheri climate the Cabernet franc ripens well, and at the same time the grape keeps a good level of acidity. The Cabernet sauvignon sometimes lacked this acidity, giving less elegant wines. In the early 80´s the vine density was low (5,000 plants per hectare) and natural yields were high. The vineyards that were acquired later were planted with 10,000 vines per hectare, and in the first vineyards an additional row was planted between two existing rows. With this the natural yields are lower, and close to what is aimed for. In the vineyards with the best natural balance no green harvest is needed. In most years de-leafing takes place. Amount and manner differ per year, but other than in France mostly the leaves at the sun side are kept (to protect the berries against the hot sun) while the leaves at the shaded side are taken away (to allow for sufficient aeration of the grapes). Various fermentation vats at Le Macchiole: oak, steel and concrete. 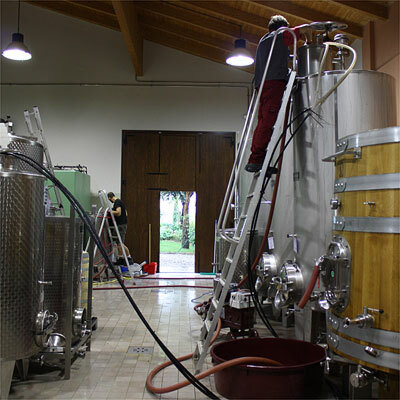 The bucket in front shows that Le Macchiole applies remontages during fermentation. délestages are also practiced. If you want to learn more about remontages, délestages etc. see my summary about the vinification at Du Tertre (pdf). Le Macchiole produces four wines, three of these are cépage wines, yet all four are actually blends of different parcels that are separately fermented. Making up the perfect blend is one of the key factors in producing Le Macchiole. And this is one of the moments where consultant Luca D’Attoma steps in, who has worked closely with Le Macchiole since 1991. Le Macchiole Bolgheri Rosso is the estate’s ‘entry wine’. It is the only red that is a blend of several grape varities (50% Merlot, 30% Cabernet franc, 10% Syrah, 10% Sangiovese) and the only Macchiole which is a DOC (Bolgheri Rosso). The 2006 exhibits round, hearty sweetish fruit, is abundant and clearly matured on wooden barrels. 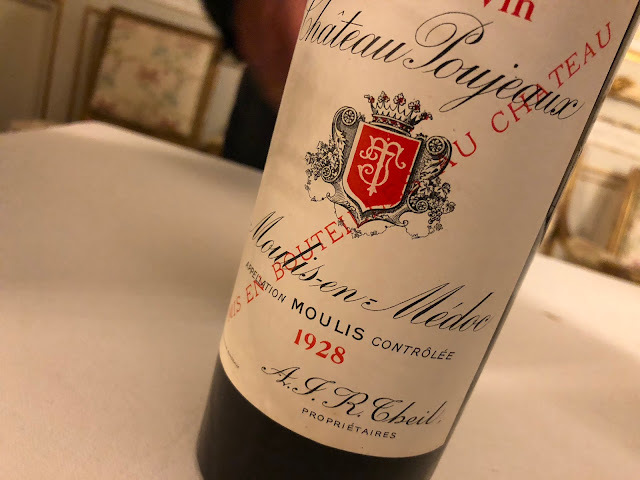 Very accessible and with a good freshness, this “clear” wine is a sort of second wine for Le Macchiole, and presented as a summary of what the estate is capable of. There is a white Macchiole, the white Paleo, I didn’t taste it, and I will write about white Bolgheri’s in a future posting. This time I only sampled reds, and the three grand wines of Le Macchiole are Messorio (Merlot), Paleo (Cabernet franc) and Scrio (Syrah). All three wines are abundant, round and ripe. The Scrio 2005 shows ink, dairy and oak. The wine is somewhat spicy too. The slightly vegetal tones in the background account for a pleasant freshness with a good (chalky, fresh) finish. The Paleo 2005 (my favourite) is a little leaner with some smoke in the nose, and with sweetness and yellow peppers. It is a clear, precise, powerful wine, spicy and fresh. The Messorio 2005 is clearly the biggest, most seductive wine. I scribbled down sweet-ripe-deep-round. It does not have the freshness of the Paleo and Scrio, it does have a big and powerful finish. What all Macchioles have in common is that they are precise and well-composed, and that on a high quality level. Ripe and round, yet clean and - especially for this warm type of wine - with a pleasant freshness. 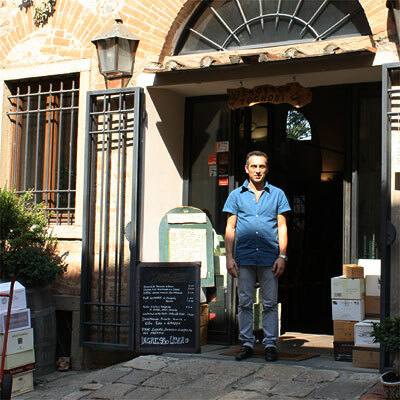 Francesco Tognoni in front of his Enoteca Tognoni in Bolgheri. Last year I recommended Francesco Tonninelli’s enoteca in Castagneta Carducci, and I visited him again this year. Here's a second recommendation: Enoteca Tognoni from Francesco Tognoni in Bolgheri (Via Lauretta, 5). With a beautiful spacious tasting room, great selection and good prices it is, just as Le Macchiole, worth a visit!